Crews have completed phase 2 of the Michelin recycled tire walkway project around Old Faithful. Last September, we reported that Michelin crews would be making new walkways around Old Faithful out of recycled tires rather than asphalt. The big selling points for the project were porousness and durability; the tire pathways allow rain and groundwater to flow more directly, reducing erosion around the pathways. In addition, the new pathways don’t leach oil into the ground. Flexi-Pave is made of rubber granules and stone held together by a polymer binding agent that is inert when cured. Its open-pore design enables fast evacuation of up to 4,000 cubic inches of water per hour. Beyond Yellowstone, this innovative product has a broad range of applications. The thousands of rubber granules making up its surface make it non-slip and it is an ADA-compliant surface accessible to wheelchairs and walkers. The integrity of the materials are not affected by freeze-thaw conditions which is why it works well in cold and snowy parts of the Northeastern and Midwestern United States. 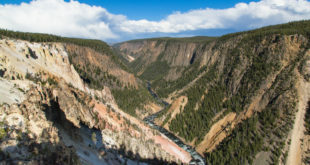 The project was made possible through a partnership between Yellowstone National Park, park concessioners, the Yellowstone Park Foundation, KBI Industries and the Michelin Corporate Foundation. “This project represents the model for collaboration between public and private organizations. We hope that this eco-friendly park walkway will inspire other similar projects that help preserve natural systems,” said Jeff Augustin, vice president of external partnerships at Yellowstone Park Foundation. Going ahead, it’s possible more asphalt walkways in the Park will be replaced with Flexi-Pave ones, should the Old Faithful walkways live up to their promise and potential.